Peanut Oil is a popular choice for sports massage therapists and cutting edge masseurs. Peanut Oil otherwise known as Groundnut Oil (Arachis Hypogaea) is a gentle, soothing and ultra-hydrating carrier oil. It contains omega oils, vitamin A and high levels of vitamin E which protects the skin from damaging free radicals and helps prevent wrinkles. It is ideal for sun damaged skin and can also be used as a hair conditioning treatment and for cleansing and moisturising acne/blackhead prone skin. 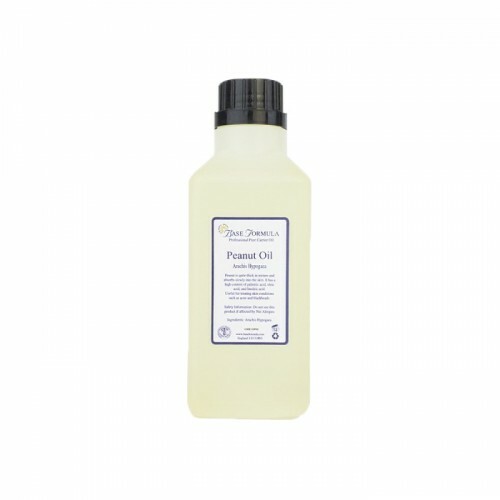 Peanut oil is a popular massage oil for sports massage therapists working on the legs and feet of runners. It is also said to be effective in treating arthritis. The oil has an interesting texture which combines viscosity with ease of application. Often used in soap making. Professional Tip: The experts at Base Formula recommend using Peanut Oil on its own or blended 50/50 with another oil such as Almond Oil. Spot test recommended when using professionally because of the risk of allergy. SAFETY NOTE: SHOULD NOT BE USED ON ANYONE WITH AN ALLERGY TO NUTS.